I grew up in the Central Valley of California. We had gardens and orchards, and the fresh produce available to us was delicious! One way that we used up that fresh produce was by making salsa. Fresh salsa. That can be made in about 5 minutes. So it’s also easy. My dad would always make this salsa for us. We had a hand-crank food processor that worked great for chopping all the veggies, and tomatoes. Now, I use my electric food processor, and it works likes a charm. If you don’t have a food processor, don’t worry; you could use a blender in a pinch. Just know that a blender might give you a finer chop on the produce, and the tomatoes might be a little more bubbly. But the taste will still be great. 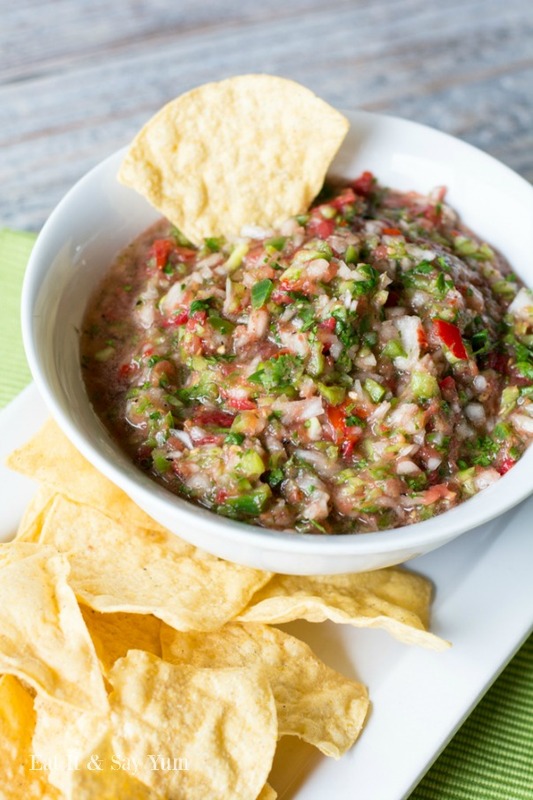 Because this is a fresh salsa, it won’t keep forever. You can store it in the fridge for a few days, but I’d try and eat it in the first day or two for best results. 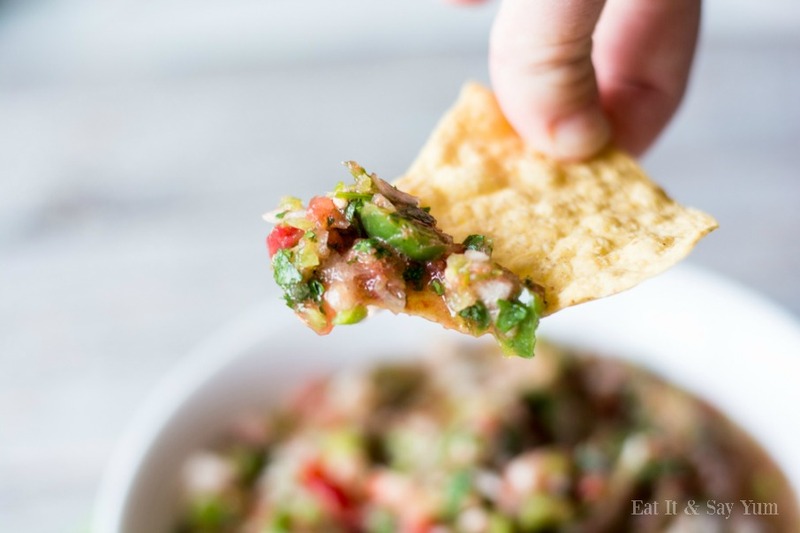 You could serve this salsa with chips, of course, but it would also be great on grilled fish or chicken. Add it to burritos, tacos, nachos, or even scrambled eggs! 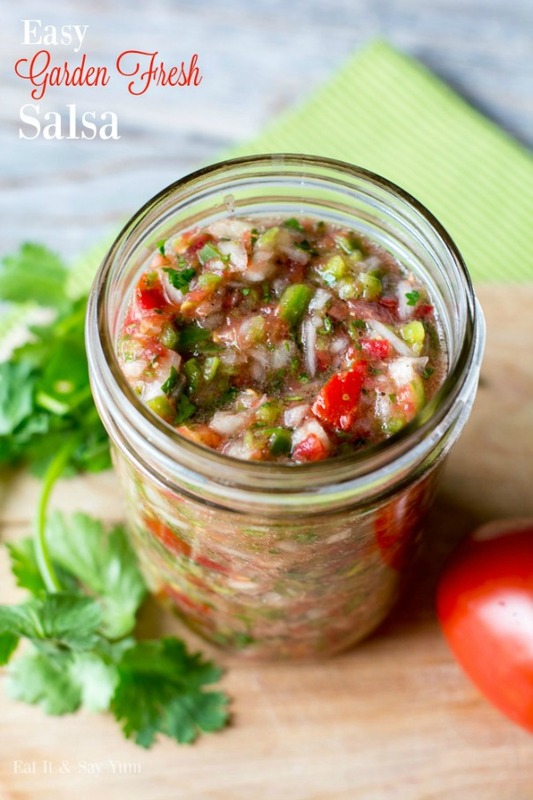 There are endless uses for this fresh salsa. Pretty much any party, potluck, girls night, etc. is made better by chips and salsa! Remove the seeds from the bell pepper, and cut it into about 2 inch cubes. Cut the onion into pieces about the same size as the bell pepper. In a food processor, add the bell pepper, onion, as much jalapeno as you like, 1/2 of the lemon (or lime) juice, garlic, and some salt and pepper. Pulse all of that until you get finely chopped pieces. Don’t liquify it! You want some chunks in your salsa. Pour this into a medium mixing bowl. Add the halved tomatoes, the cilantro, 1/2 the lemon juice, and a little more salt and pepper to the food processor. (No need to wash the food processor between mixing.) Pulse the tomatoes until they are finely chopped as well. They will be more liquidy that the bell pepper mixture, that’s why we don’t process them together. Pour the tomato mixture into the bowl with the bell pepper mixture, stir together to combine everything. Add more salt and pepper as needed. Serve right away, or store in the fridge until ready. Keeps for a few days, best used right away. For more delicious recipes, visit Eat It & Say Yum!